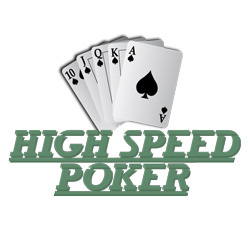 What does speed poker stand for? Texas hold ’em is one of the variants of poker that appeared a long time ago but suffered very little changes over the course of time. Whether it was played in home games, real-life casinos or over the Internet, the game is pretty much the same and it is hard to think of worthy improvements. Online poker has the benefit of being fast paced and players can choose to compete at different tables simultaneously if they have the ability to focus at all of them. The latest innovation to the game was made by online casinos who introduced speed poker, a variant of Texas hold ’em that has one major difference. When you sit down at a speed poker table, you need to know that as soon as you fold your hand you will be moved to another table entries you play instantly. You don’t have to wait for the hand to conclude, and you won’t even get the chance to see who won the pot, because you will be already playing a different hand. This comes as a relief for those who don’t like the idea of multi-tabling, but are not patient enough for waiting for other players to make their move when they have already folded their cards. Tight aggressive players are the ones who benefit the most from these change, because they are playing a relatively narrow range of cards. The advantage is that even if you choose to play only premium hands, the frequency would be so high that sooner rather than later you will be dealt cards that are worth playing. The disadvantage is that you will always compete against new players, and don’t get the time to learn their betting patterns, and you wind up playing the cards rather than the opponent. Another downside is that Speed poker doesn’t allow players to create a table image and benefit from it.